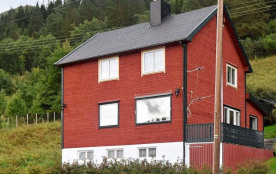 A renovated (2016) holiday cottage with a whirlpool and panoramic view of mountains and fjord. Good fishing conditions. The renovation included using bright colours throughout the house. The well-equipped kitchen has a small wood-burning stove. 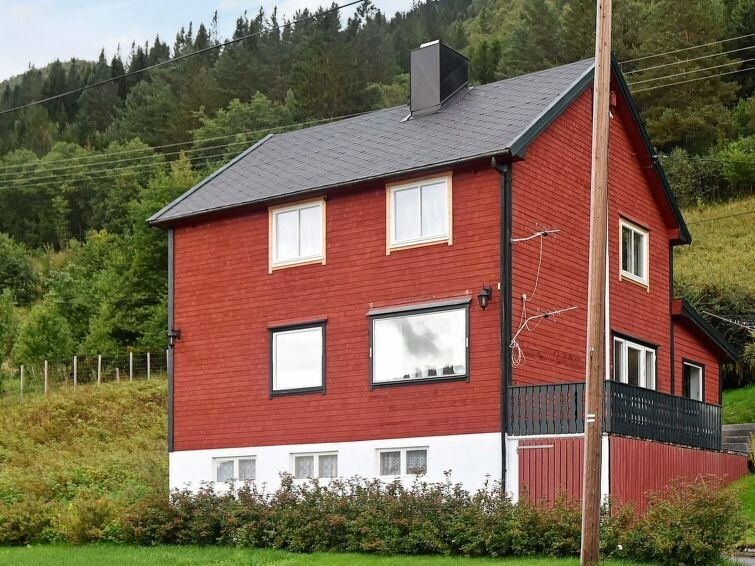 There is also a stove in the living room where you can enjoy the view of the fjord and surrounding mountains. Tiled bathroom with whirlpool (1-2 persons) combined with steam shower. The nearby area is suitable for hiking in the forest. There is a trout and salmon river 19 km away. A combined hot/cold smoker can be used for smoking the fish. There are two boats available for rent in a harbour 40 metres away: An 18 ft Skvegg boat with 25 hp motor, control panel and screen, GPS/chartplotter/sonar and a 16 ft boat with 25 hp with GPS/ chartplotter/sonar. There is also a room for storing fishing equipment and a covered fish cleaning table with lights and running water. The house is located right by road RV64 and some traffic noise may occur. There are two 190 cm long single beds that can be combined into a double bed.